← Rabbi Shmuley is still far from the Truth! 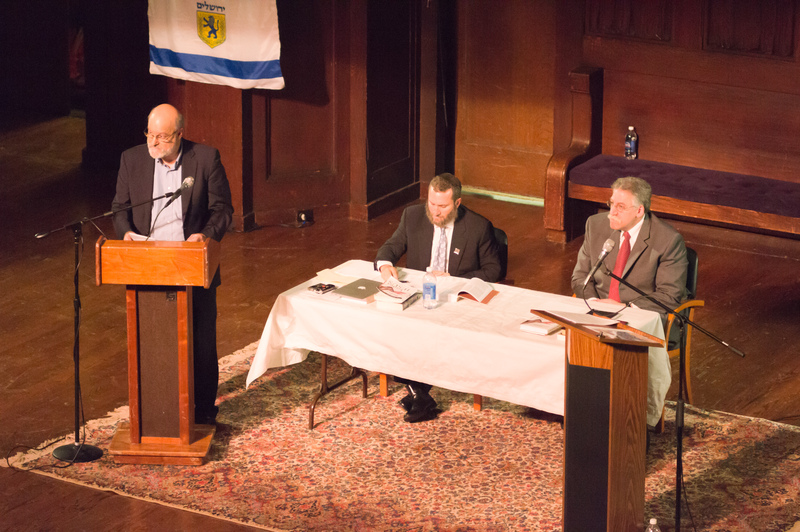 Mike Brown and Shmuley Boteach debated before an audience of more than 700 Jews and Gentiles, believers and non-believers, on the Upper West Side of Manhattan last night.The debate focused on Shmuley’s book, Kosher Jesus, and Dr. Brown’s forthcoming book in response, The Real Kosher Jesus. Brown summarized Rabbi Boteach’s viewpoint as being completely opposed to any reasonable interpretation of the New Testament. Brown suggested that Shmuley turned Jesus into a rebel against Rome, who taught nothing new and died because of his treason against Rome. According to Shmuley, Paul was the person who reinvented Jesus and transformed him into a Divine Messiah who died for the sins of humanity. In effect, according to Dr. Brown, Shmuley has stripped Jesus of the uniqueness ascribed to him in the New Testament scriptures. Shmuley responded by painting a picture of Jesus as a Jewish freedom fighter who was both a sincere zealot for Jewish causes and a great rabbi who taught in a way similar to the rabbis of his day. Mike said that the only way Shmuley could be correct would be to assume that the entire New Testament, from Matthew to Revelation, was edited and influenced by later Christians, inspired by Paul, who elevated Jesus to a status he never claimed for himself. Mike noted that Shmuley gave very little historical or other type of evidence to justify such a radical reinterpretation of the New Testament. The debate was successful in raising critical issues about Jesus. Clearly both Mike and Shmuley agreed that Jesus was Jewish and spoke as a rabbi and a Jewish prophet But that is where their agreement ended! There has clearly been more interest in the Jewishness of Jesus within the Jewish community, from Kosher Jesus to a new Jewish Annotated New Testament edited by Jewish scholar Amy-Jill Levine and Marc Z. Brettler. Hopefully more and more Jewish people will study the New Testament and discover that indeed Jesus is Jewish, and more importantly, the Messiah and Savior of the world.For more information on why the New Testament should be taken more seriously as an historical document, read the book, Isaiah 53 Explained. It is yours for free at www.isaiah53.com. The question of the Identity of Jesus Christ is the most important issue of Life and History. … as it is sometimes said, “If Jesus REALLY WAS (AND IS) Who He claimed to be, – and Who those who knew Him best INSISTED & DECLARED Him to be: well, in terms of actual significance: whatever is in second place after than one barely even registers on the scale of value.” HIM BEING MESSIAH & REDEEMER IS THE WHOLE BALLGAME.